Are We About To Create A Real-Life Captain America? The FDA has given a biotech tech firm the A-OK to start embryonic stem cell therapy trails. First up? An Iraq war vet who was paralyzed from the chest down in 2005. Yesterday it was announced that Iraq War veteran and Marine Matt Cole, paralyzed from the chest down since a 2005 insurgent attack in Iraq, has enrolled as the first patient in the first FDA clinical trial of adult stem cells used to treat spinal cord injuries. The procedure involves removing a couple of thousand adult stem cells from Cole’s bone marrow, multiplying them in the lab and injecting them into his spinal cord. That should happen later this month. Nine other patients have also been enrolled for this phase of the trial, which is being undertaken by TCA Cellular Therapy in Covington, La. Is that super serum enough for you? Me too. Now who wants to send Matt a shield… just in case. 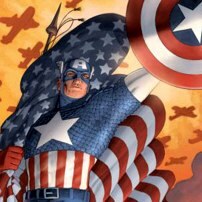 Posted in Awesome, Captain America | Comments Off on Are We About To Create A Real-Life Captain America? You are currently browsing the archives for the Captain America category.